I attempted to clean up and assembled one of the Bane Thralls, sans pauldrons. I set them up next to the figure so you can see how huge they are. They look like pieces from a segmented sewing thimble! You can see that the platforms on which the pauldrons are supposed to sit could look like more modest pauldrons on their own, if I dressed them up a little. So I might just try that. I need to go back and spend some more time cleaning up mould lines, especially on the fingers. I can't say I am a fan of whatever this material is. It's like they used something that combines the worst qualities of lead/metal and polystyrene. Filing the stuff leaves a lot of texture and "fluff" that needs cleaned off, similar to styrene. Normally I use an knife on the styrene, which did seem to work better with this stuff. But it's a harder plastic/resin, so it doesn't cut/scrape as nicely. This one looked like it had a gate/tab/sprue/whatever on the collar that had been cleaned off, but left behind a pretty rough, chunky surface. That and the fingers were the worst parts to clean. In spite of that, I still like the sculpting, aside from the head and pauldrons, and they are nice designs. You can see in the pic that they are much smaller than those old, monstrous Citadel skeletons. But they're bigger than just about anything. I think the Bane Thralls should fit well with the Mantic stuff, which is good since I have a big pile of their skeletons to work on eventually! In fact, I think I will also look into using some of the Mantic skeleton heads on these. 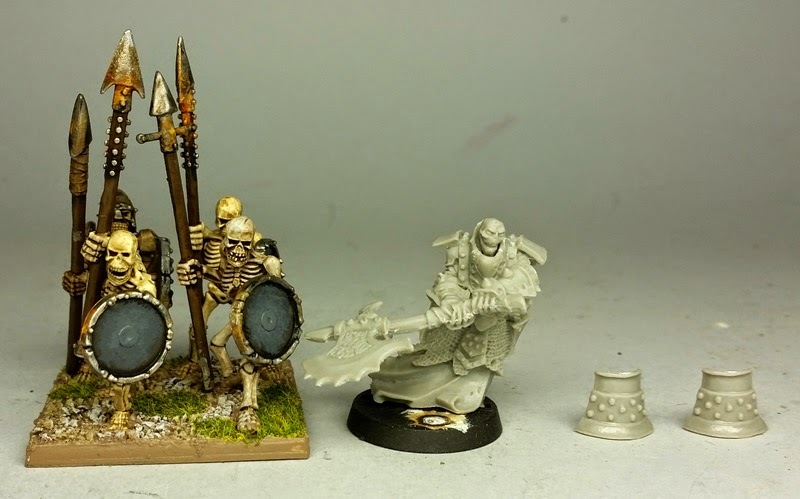 If I can get my hands on some of the current GW skeleton heads, those might also fit.